Victor G. Wightman, 82, died Wednesday, July 7, 2010 in Eupora, MS, after a short illness. Born April 17, 1928, in Staten Island, New York, Victor began a long and rewarding teaching career at the Detroit Institute of Technology. He also taught at Lorain College (OH); Wisconsin State University @ Eau Claire; Lakehead University (Ontario, Canada); and Niagara University (NY). Before retiring, he taught at Wood Junior College in Mathiston for ten years (sociology, history, French, and Spanish). Mr. Wightman, also known as "the Professor," is remembered as a gentle man and as a scholar. Fluent in seven languages, he also enjoyed a passion for the history of names as a lifelong hobby. 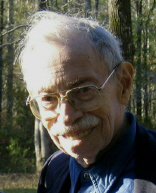 Mr. Wightman�s great love for linguistics and music were regularly shared with all who knew him. He was a gifted and sensitive musician on piano and organ. A longtime member of the American Guild of Organists, Mr. Wightman served as organist at Aldersgate United Methodist Church (Starkville, MS) and, more recently, at Maben (MS) United Methodist Church. He was kind and caring especially to children and those in difficult circumstances. He was also a keen political observer with a biting wit, and an avid sports fan. Mr. Wightman was predeceased by his beloved wife Irene Reed, and one son, Victor Johann. He is survived by his sister Frances Pritchett and family of Little Rock, AR; his brother Walter Wightman and family of Staten Island, NY; three children, Arthur of Tahuya, WA; Johanna of South Pasadena, CA; and Rebecca of San Francisco, CA and their families/partners; two step-children, Henry and Jenny Schipper, both of CA; and two grandchildren, Chloe Wightman and Dominic Schwartz. At Mr. Wightman's request, there will be no formal service. In lieu of flowers, the family requests that memorials or donations be made in Mr. Wightman�s name to your favorite charity.